UFC veteran and current Tachi Palace Fights middleweight champion David “The Crow” Loiseau has pulled out of next week’s bout against Giva Santana, according to Tachi Palace event coordinator Jeremy Luchau. 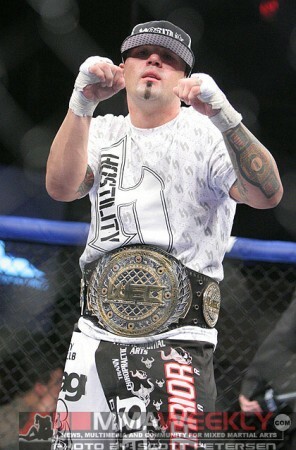 Stepping in to take his place is former WEC champion Doug “The Rhino” Marshall. “Loiseau has an undisclosed injury and Marshall steps in on eight days notice. The fight is now a non-title bout at 185 pounds,” Luchau told MMAWeekly.com. “We got the news yesterday from his agent, Ken Pavia, that Loiseau would not be able to compete and would need surgery. The team scrambled right away to find a suitable replacement and the Rhino was eager for the opportunity. Known for his devastating submissions, Santana (15-1) has won four fights in a row. The only loss on his record comes by way of a split decision defeat to Jamie Jara in EliteXC from a few years back. Marshall (12-4) was on a five-fight winning streak before Kyacey Uscola derailed him last September at Tachi Palace Fights 6. Stay tuned to MMAWeekly.com’s Rumors section for all the latest news and updates to the Tachi Palace Fight 10 fight card.